Jaime Lee Trujillo, 67, passed away suddenly at home on March 15th, 2018. Jaime was born on March 1st, 1951 in Tierra Amarilla, NM. He was married to his loving wife, Doris for 42 wonderful years. 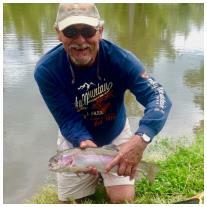 Jaime was a dedicated family man, avid outdoorsman and skilled craftsman. He was a friend to everyone. If he wasn’t with his family or on a building site, he was out catching a fish. He always lent a helping hand with a smile on his face. Preceded in death by his parents, Edward and Simonita Trujillo, three young siblings early in life, his uncles Sabine and Albert Ulibarri, and aunts Josephine Kaiser and Beatrice Trujillo. Jaime is survived by his wife Doris, son Jaime and wife Jessica, daughter Andrea and husband Zachary, and granddaughters Isabella and Maya. Siblings Rosemary Trujillo, and Edward Trujillo and wife Anita. Mother in law Teresina Rivera. Siblings by marriage Orlinda and Joe Torres, Debra Rivera-Sommer, Donna Botkatzian and partner Matt, Ted and Evelyn Rivera, Annette and Anthony Legits, Lisa and John Morrison. Many nieces and nephews. Many life-long friends. Honorary pall bearers Jack Barela, Chris Tafoya, David Sena, Glen Tafoya, Richard “Dickie” Sena, Ralph and Leonard Romero, Ron Seguda, and Carlos Ulibarri. Jaime served honorably in the National Guard for 6 years. He lived his life selflessly and touched many lives. You will continue to see Jaime in the homes that he built, rivers he fished and the mountains he hunted. A rosary will be held in his honor on Thursday March 22nd, 11 am, St. Anne Parish followed by the funeral mass at 11:30 am. Berardinelli Family Services, Santa Fe.